Contemporary Theories of Economic and Social Justice, an advanced elective course developed by Prof. Aviad Heifetz, Vice President for Academic Affairs, was first offered to students this year. The course exposes students, particularly in practical fields, to a wide range of theories in philosophy and political science. The theories are interwoven with societal issues and dilemmas, to address the tensions of liberty vs. equality, communitarian vs. universal justice, affirmative action, group rights of cultural minorities, and feminism. Social Digital Rights Management (DRM) protects the online course materials, while the flow of ideas facilitated by sophisticated learning technologies challenge students' beliefs and values. Participants acquire improved skills for confronting dilemmas that they will encounter in their future personal and professional lives. 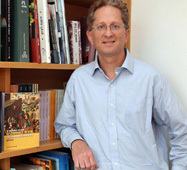 Prof. Aviad Heifetz, Vice President for Academic Affairs. Cyberbullying is yet another manifestation of bullying among children and adolescents; a phenomenon resulting from Internet technology and social networks; and another form of aggression begging school and home intervention. From 2011-2013, OUI researchers, Dr. Tali Heiman and Dr. Dorit Olenik Shemesh, in cooperation with Dr. Sigal Eden of Bar Ilan University, examined the relationship between cyberbullying and socio-emotional aspects constituting risk, among children and adolescents in Israel as well as protective factors. They also studied teachers' perceptions of the phenomenon, and their coping strategies. The study cites age, gender and self-efficacy as indicators of susceptibility. Dr. Heiman and Dr. Olenik Shemesh are continuing their research as part of a multinational consortium of research teams, under the auspices of the European Union. They have presented their data to the Israel Ministry of Education, and continue to present at conferences in Israel and internationally. Prof. Miriam Souroujon, Dean of Research with Dr. Tali Heiman and Dr. Dorit Olenik Shemesh (left to right). The Ninth Annual Chais Conference, showcasing research on innovative learning technologies, was opened by OUI President, Prof. Kobi Metzer and Dr. Nitza Geri, Head of the Research Center for Innovation in Learning Technologies, on February 11, 2014. Hundreds of guests attended the two-day conference, which was spearheaded by a lecture "Open Learning Requires Open Minds: The Challenges of Online and Blended Learning Environments for NetGen Students and their Instructors" by Prof. Thomas C. Reeves of the University of Georgia. The lecture addressed the idea of task-switching, as opposed to multi-tasking, and interaction, not memorization, which have become prevalent in 21st century learning. Conference sessions covered diverse topics, including how technologies affect teachers' performance, learning from video, gamification, learning communities in cyberspace, and behavioral implications of learning technologies. Prof. Thomas C. Reeves delivers opening lecture. If you would like to unsubscribe from this mailing list, press here.